The complex marine environment, with its wide range of life-forms, is being increasingly recognised as vulnerable to human activities. Regulatory pressure is growing to assess and monitor the effects of these activities. Implementation of the rapidly evolving legislation is made more complex by the frequent need to combine Health, Safety and Environmental issues. In addition, account must be taken of the perceptions and opinions of non-governmental organisations, and the general public. Environmental concerns are becoming critical in the determination of commercial practices. Ecosea does not simply address these issues, we promote them. Our corporate philosophy is to develop marine coatings that are not only effective and long lasting, but are not harmful to the environment, non toxic and do not damage marine life. To achieve this goal we have conducted significant and detailed research - globally. Our findings have been corroborated independently by some of the worlds leading research organisations. Cuprotect® remains completely clear of fouling. 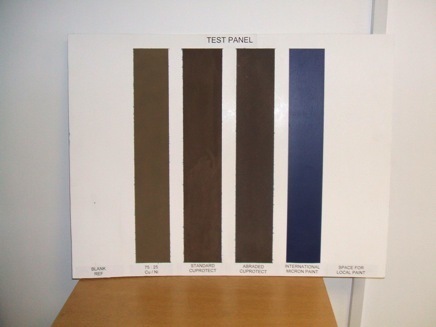 Test panel before immersion in Scotland 2006. All 3 versions of Cuprotect® are almost unaffected by mussel growth - while conventional antifoul paint from competitors is already covered. Independent trials were commissioned by a client and conducted on their behalf by the Sacred Heart Marine Research Centre in Tuticorin Bay, India. 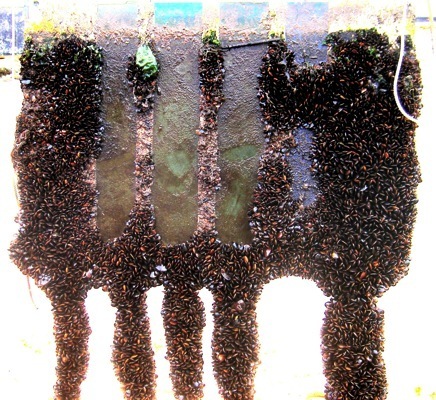 This research centre was chosen as the bio fouling experienced in this region, due to the high ambient water temperatures and UV light levels, emulated the fouling that is prevalent in the clients area of operation - in this case the Gulf. Bio fouling in both regions is prolific and difficult to control. A trial panel was prepared; one surface was coated with Cuprotect® while the reverse side was untreated. The panel was then submerged and monitored on a regular basis for over 1 year. In the photographs below, taken at regular intervals, the photograph on the left in each case shows the Cuprotect® side, while that on the right is the untreated side. 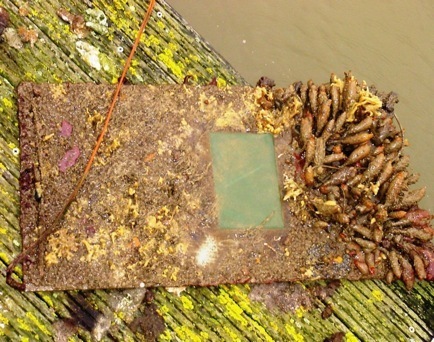 In the last set of photos below (taken at 1 year) the fouling shown is not attached to the Cuprotect® side, but rather is growing from the untreated side of the panel. The benefits of our products have been recognised as reducing fuel consumption in marine vessels, which in turn could significantly address carbon footprint issues. Ecosea has been awarded accreditation and funding from the Carbon Trust for its contribution towards energy management. This reflects not only our research into marine coatings and resulting greater energy efficiency, but also our commitment to a cleaner and healthier environment. The Carbon Trust’s mission is to accelerate the move to a low carbon economy by working with organisations to reduce carbon emissions and develop commercial low carbon technologies. Carbon Trust Investments finances emerging clean energy technology businesses that demonstrate commercial potential. It specialises in identifying and investing in early stage technologies and credible management teams with the ability to create and deliver clean energy businesses. It is a co-investor of choice in the low carbon technology field. The investments team is strongly supported by in-house technical and strategy groups. The Carbon Trust was set up by the UK Government in 2001 as an independent company. The first major independent trials for Ecosea were conducted by Cefas, (Centre for Environment, Fisheries & Aquaculture Science). Cefas is an internationally renowned scientific research and advisory centre working in fisheries management, environmental protection and aquaculture. Cefas have a staff complement of over 500 based at three specialist laboratories within the UK, their own ocean-going research vessel and over 100 years of experience. Cefas have a long and successful track record in delivering high quality science to many customers around the world. Many Cefas scientists are leaders in their fields and advisors on international bodies such as the International council for the Exploration of the Sea (ICES). Cefas is an Executive Agency of the UK Government's Department for Environment, Food and Rural Affairs (Defra). conducted by a team of 4 scientists at Cefas. The trials were conducted according to the ISO standard for determining release rate of biocides from antifouling paint. Unfortunately, some of the other products tested failed. As a consequence we compared the results for copper nickel with those obtained by Cefas from tests using products from the leading antifouling suppliers, carried out by the same Cefas team a year earlier. Through the 42 days of the test, 90:10 copper nickel (as used in Cuprotect®) showed a copper release rate less than 50% of the next lowest product and just 31% of the average of the sample. The normal method of measuring the release rate is the daily average over the last 21 days of the test and here copper nickel was 36% of the next lowest sample and 21% of the average. The conclusion is that 90:10 copper nickel, is far better for the marine environment than any of the products put forward for comparison by the leading manufacturers of conventional antifoulings. Not only is the copper release rate much lower but Cuprotect® does not contain any organic biocides - unlike all the other products tested. Further independent trials were undertaken by QinetiQ's multidisciplinary team of experts in Hampshire UK. Previously part of the UK Ministry of Defence, QinetiQ are now a major public company, with an annual turnover exceeding $2.5 Billion. They are renowned for providing innovative, technology-based solutions and support services for government organisations and commercial customers around the world. QinetiQ were commissioned by Ecosea to perform salt fog testing to determine the Corrosion performance and adhesion quality of Cuprotect® under arduous conditions. The test results proved beyond any doubt the durability of Ecosea’s coatings and in particular Cuprotect®. “Corrosion resistance testing of the Cuprotect® coating system”. The standard Cuprotect® coating system comprising a micaceous iron oxide/zinc-rich primer, 2 coats of ferroguard anticorrosive and the Cuprotect® epoxy binder/copper nickel powder antifouling top coat was applied to duplicate cold rolled mild steel panels degreased and abraded with coarse silicon carbide paper prior to application. The final mean coating thickness was 289μm. This coating was permitted to cure at ambient temperature and humidity for 7 days before corrosion testing under neutral salt fog conditions complying to ASTM B117 / BS 3900 F12 for a total of 1000 hours. agent. The coated surface received a single angled scribe line cut to the substrate before testing. Pull off adhesion testing was employed to determine the adhesion strength of the coating system before and after corrosion testing. After salt fog testing the duplicate steel substrate Cuprotect® panels displayed no significant blistering or rusting through the coating. Ferrous rusting was limited to the scribe line; with green corrosion products from the copper alloy powder layer also apparent. The extent of corrosion creep from the scribe line was determined by scraping away loose coating with a sharp blade to reveal any rusting beneath. Scribe line creep for the Cuprotect® coating was limited to 1.0-2.5mm . A single area of coating 10mm from the scribe line was detached by the scraping, but no corrosion of the underlying steel was found to have occurred. the Cuprotect® coating and the steel panel was observed. 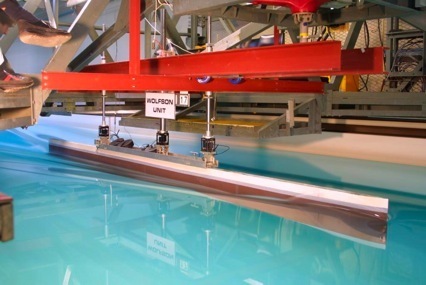 The Wolfson Unit for Marine Technology and Industrial Aerodynamics is part of the Research Institute for Industry in the School of Engineering Sciences at the University of Southampton. They work closely with the Department of Engineering and Naval Architecture at the Southampton Solent University and are world renowned for marine design, wind tunnel and tank testing. Since 1983 they have provided testing and consultancy services to many of the Americas Cup Yacht teams. The Wolfson Unit were engaged by Ecosea to perform a number of tests and trials to determine the drag co-efficiency of Cuprotect® as drag related to surface profile and bio fouling, would have a major impact upon fuel costs, particularly for large ocean going vessels. Tests were conducted by the Wolfson Unit during 2005. Using three specially constructed 4.7m simulated hulls, measurements were taken with a 3-post dynamometer and associated equipment at range of speeds from 0.34m/s – 4.0m/s. The first of the three hulls was polished to a surface profile of +/- 2μ. The second was coated with a well known conventional antifouling producing a surface profile of 70μ and the third was coated with Cuprotect® with a surface profile of 148μ. The Cuprotect® profile reduces to 110μ after a few weeks immersion and stays at that level throughout its working life, whereas conventional antifouling typically increases surface roughness by about 25μ at each docking. The test results revealed that drag differential between Cuprotect® v conventional antifouling, on a 20m work boat with an operating speed of 12 knots after 1 years operation is 0.4%. The same results were found for a 200m container ship operating at 22 knots, while for a navy destroyer operating at 30 knots, the differential at 1 year was 0.3%. In all cases after 2 years service Cuprotect® was found to produce less drag than a conventional antifouling. the Wolfson unit in Southampton, UK. Ecosea test panels, boats and platforms have been submerged around the world and the carefully monitored results, over several years, have proven the efficacy and durability of our products. Before launching our products onto the market, Ecosea have conducted an incredible amount of ‘in house’ research, tests and trials - globally. We have studied not only our products, but what affects them and what effects our products have on the environment. Our trials and research data have been supported and corroborated by independent research, provided by some of the worlds leading research organisations. This has allowed us to better develop our products for our customers and to meet our corporate goals. From the Baltic to the Mediterranean, Caribbean and Atlantic to the Pacific, trial panels have been submerged, monitored, photographed and inspected, over weeks, months and years. Around the world, offshore platforms, boats, ships, pipelines, strakes, nets and buoys have received our products and again, have been monitored in the same way. Ecosea and our products, as our name suggests, are committed to producing effective products which are not harmful to our marine environment. Our products contain no organic biocides, Tributytlins (TBT’s), or any substance known to be toxic or harmful to our environment.